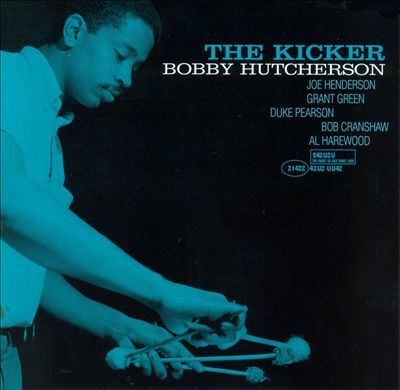 It can only be attributed to the risk of market overflow that Blue Note didn’t release vibraphonist Bobby Hutcherson’s de jure debut album The Kicker in 1964, a superb date including Joe Henderson, Duke Pearson and Grant Green. HHutcherson & Henderson. Sounds like the misfits of the insurance business have joined forces in a run-down office on the outskirts of town. But the late Bobby Hutcherson and Joe Henderson are regarded as towering figures of mainstream and avant-leaning jazz now, and as burgeoning class acts back then at the tail end of 1963, when they were really hitting their stride. Hutcherson had built a reputation first on the West Coast, subsequently in NYC, he had played on front-line beauties as Jackie McLean’s One Step Beyond and Grachan Monchur’s Evolution. Henderson had recorded two albums as a leader, Page One and Our Thing. The Kicker was left on the shelves, seeing release as late as 1999. It is puzzling why Lion and the Wolff decided against release. They probably figured they had enough quality sessions to promote. Perhaps Joe Henderson was the kind of perfectionist disgruntled by the rough edges around a phrase or two. It doesn’t have to perfect, Joe. Coming with your package of supple, soaring post bop, we just might come to like that extra bite. Regardless, there’s a pairing of talent attuned to each other’s needs and shining brightly during a set of original compositions and one standard, a sprightly mid-tempo take of Lerner and Loewe’s If Ever I Would Leave You. The crystalline, ringing vibes of the versatile modernist Bobby Hutcherson. Joe Henderson, already a strong-willed counterpart of a yes-man. Duke Pearson, inspiring accompanist, weaver of mellifluous lines. Grant Green, featured on side B’s three tracks, the prolific in-house guitarist of the Blue Note label, a class act in both hardboppin’ and modal contexts. Around that time, November 4 and 15 to be exact, 1963, Green, Henderson, Pearson and bassist Bob Cranshaw had cooperated on one of Grant Green’s career highs, Idle Moments. The mutual understanding is evident. Hutcherson was a major contributor to Eric Dolphy’s free jazz classic Out To Lunch on February 5, 1964. He would venture into more front-line territories soon, recording his de facto debut Dialogue, and subsequently, the avant-garde LP side of Joe Chambers tunes on Components and the Happenings album with Herbie Hancock in 1965. A travel into uncharted territory. A balancing act of simplicity of expression and complex context. New vistas for vibraphonists ever since, the guys spellbound by Hutcherson’s siren-like cadenzas, the move into dark-hued corners of the mind, the zing of his angelic sound. Already apparent on The Kicker is Hutcherson’s alert ear for group dynamics and controlled, conversationalist approach to the development of his expertly meandering lines. The great mood piece by Joe Chambers, Mirrors, suits Hutcherson to a tee. Throughout the set, which also consists of Henderson’s The Kicker and Step Lightly, Hutcherson’s For Duke P. and Pearson’s Bedouin, the rhythm section flawlessly and in uplifting fashion underscores Hutcherson’s vibe abacadabra and Henderson’s playful imagery. Henderson’s notes form fine-tuned blue and odd clusters, placed with a keen, floating sense of timing. Though the title track, The Kicker, doesn’t thrive on the background riffs that propel the soloists into action as convincing as the classic take of Horace Silver on the Song For My Father album (including Henderson) and Henderson’s own version in 1967, it is a smokin’ affair, benefiting from the addition of Green in the ensemble and the guitarist’s propulsive, vivacious statements. Perhaps the moving, succulent phrases of Hutcherson and Henderson during Step Lightly should be attributed to the presence of Green, blues master at heart. Surely Dialogue made up for a more distinct debut. But The Kicker remains a winner, having earned its rightful place among the hard bop cookies that rolled off the assembly line of the Blue Note label in the early sixties.